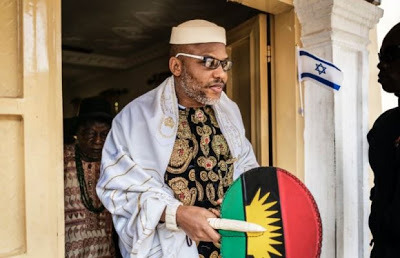 Rivers And Benue Leaders Warn Nnamdi Kanu - "Don’t’ Bring Your Madness Here"
Few prominent leaders in Rivers and Benue state have finally reciprocated to the plan by leader of the Indigenous People of Biafra (IPOB), Nnamdi Kanu, to extend his proposed Biafra Republic to their states. The leaders in their reaction have strongly rejected the claim by the IPOB leader that while he was in detention, an agent of the federal government had offered him to secede with the five Igbo states but that he rejected the offer because it did not constitute the complete territory of Biafra. According to PUNCH, his claim has infuriated some prominent leaders in Benue and Rivers states who questioned the mental state of Nnamdi Kanu.. Speaking on the issue, a prominent Benue leader who is a retired police chief, Abubakar Tsav, said Kanu’s speech has shown that the IPOB leader must have some mental disorders. “I think the man has some mental problems. What is the connection between the Tivs, the Idoma and the Igbo? I think the man needs to see a psychiatric doctor because something is wrong with him. “He is not well because nothing connects the Tivs, the Idoma to the Igbo. How can he say he wants Benue State to be part of Biafra?